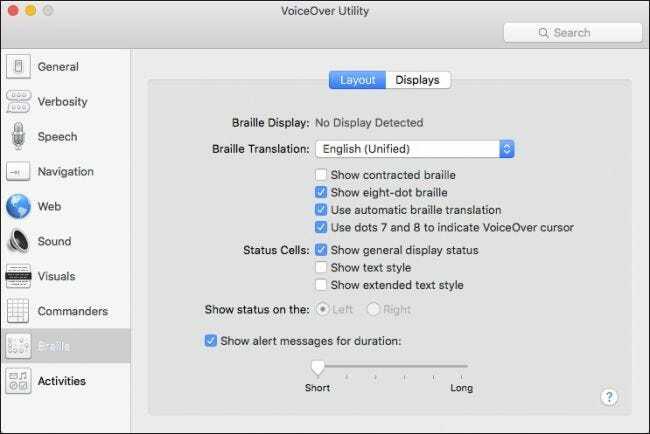 If you have problems with your vision or would like to have your Mac read stuff on your screen to you, then you can have it do so in just a few simple steps using the VoiceOver utility. The VoiceOver utility is used to read screen contents such as windows and menus, so you know what is on the screen and you can control your computer using the keyboard. 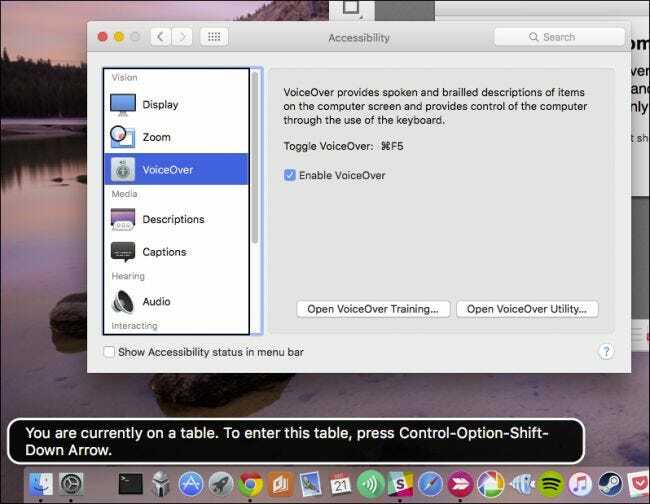 To access the VoiceOver Utility, you need to open the Accessibility options found in the System Preferences. Once open, click on “VoiceOver” to access the utility. 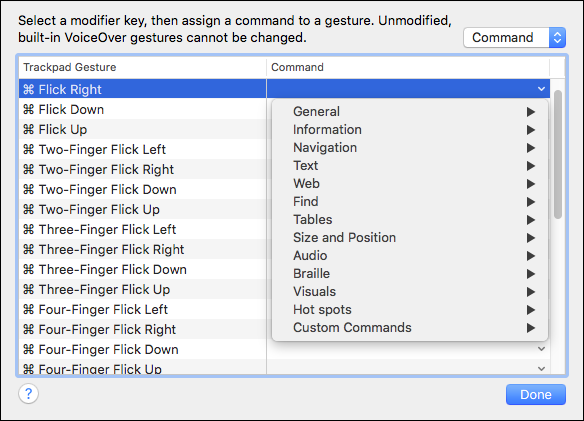 VoiceOver can also be toggled on or off using the keyboard shortcut “Command+F5”. When you first open VoiceOver, an introductory screen will appear and the narrator’s voice will describe what VoiceOver does. You can disable this screen by ticking “Do not show this message again”. Then, in the future, you can turn VoiceOver on quickly just by pressing Command+F5. When you are using VoiceOver, the narrator will describe each element of the screen you are currently accessing. For example, in the following screenshot, we see that we’re on a table. If we want to enter this table, we would use the keyboard shortcut “Control+Option+Shift+Down Arrow”. Whenever you move from one element to another, a corresponding textual description will appear in the bottom-left corner of the screen and the contents will be narrated. If you want to learn the ins and outs of the VoiceOver assistant, then you should click on “Open VoiceOver Training…” to start the VoiceOver tutorial. 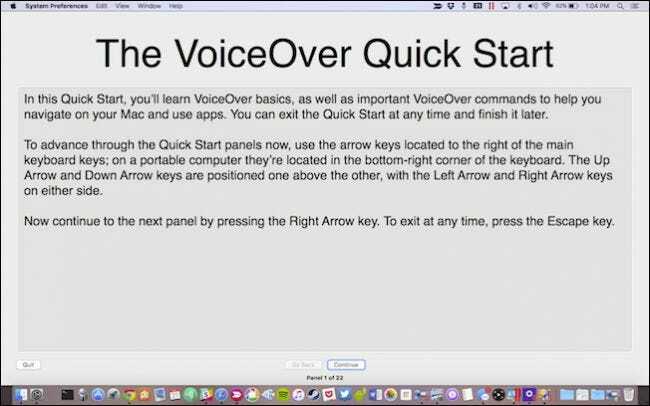 You will be able to step through the VoiceOver tutorial by using the left and right arrows located on you keyboard. Just keep in mind that, if you do move forward to the next screen and then go back, the screen contents will be read to you from the very beginning, so make sure it is done reading everything to you before advancing. With VoiceOver on, you can now navigate your computer and will be told what screen element you’re on, what it does, says, and how to interact with it. For example, when you visit a webpage, VoiceOver will tell your where you are on the webpage, and what keys to use to navigate it. 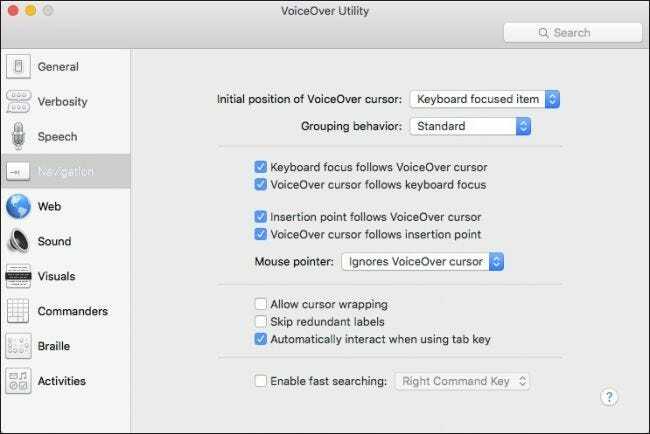 To turn VoiceOver off, simply use the keyboard shortcut “Command+F5” again. 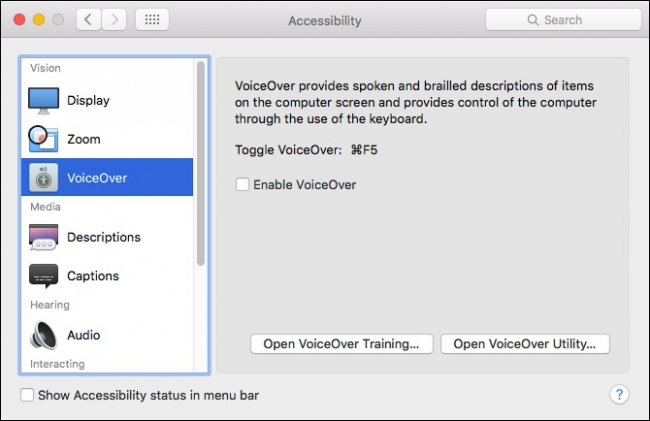 When you access the VoiceOver assistant from the Accessibility preferences, you can click the option to open the VoiceOver Utility, which will let you access an array of configuration options. To begin, there are the General options, which will simply let you define a greeting for the VoiceOver utility to speak after you log in. 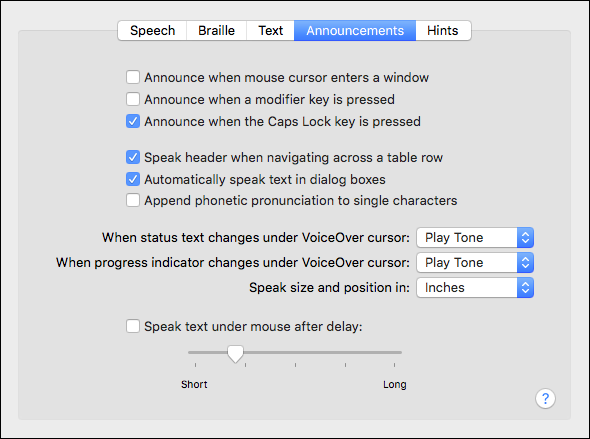 Additionally, you can decide which modifier keys to use for VoiceOver, and whether VoiceOver is allowed to be controlled with AppleScript. One of the more interesting options are for the portable preferences, which will let you save your VoiceOver options to a portable drive so you can take them with you and use them on another Mac. The next option is to define verbosity. By default, the speech verbosity is set to “High”. If you perform repetitive activities and feel VoiceOver talks too much, then you can turn the verbosity down. Checking out the options for “Text”, you see how the VoiceOver Utility will function when dealing with text. For example, when you type, it will speak characters and words, read numbers as digits, and so forth. On the “Announcements” tab, the VoiceOver Utility will announce events such as when the Caps Lock key is pressed, speak text in dialog boxes, and many other items. You’re probably beginning to now see why there’s an option to take your VoiceOver configuration with you. There are a lot of options! 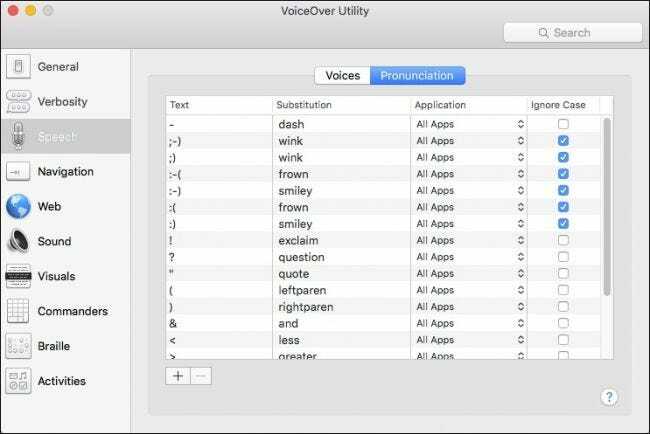 On the “Pronunciation” tab, you’ll be able to define how the VoiceOver Utility describes certain text elements like emoticons and punctuation symbols. The “Navigation” items are fairly simple. 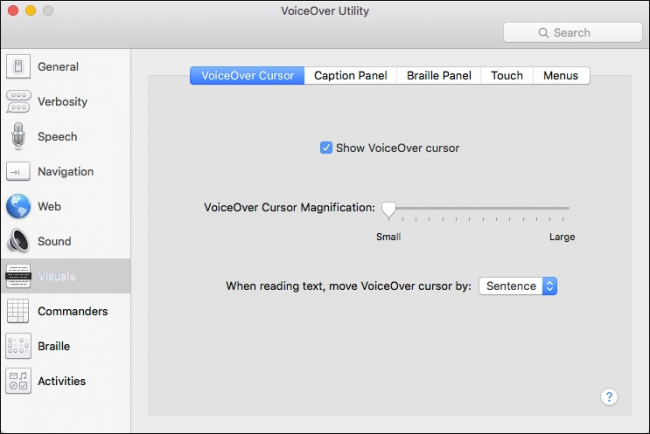 With these you will be able to dictate how VoiceOver tells you where you are, such as if the VoiceOver cursor follows insertion point, or vice-versa, and so forth. The web section handles all aspects of Internet browsing, such as Navigation, Page Loading, and something called Web Rotor, which basically lets you cycle through elements on a webpage using your arrow keys. Next, we have the Sound item, which as you might have guessed, handles aspects of your computer’s sound with regard to the VoiceOver Utility. You can mute sound effects when the VoiceOver Utility is active, enable audio ducking, which means that if you’re listening to something like a song or podcast, it will automatically become quieter and allow the VoiceOver Utility to be heard. 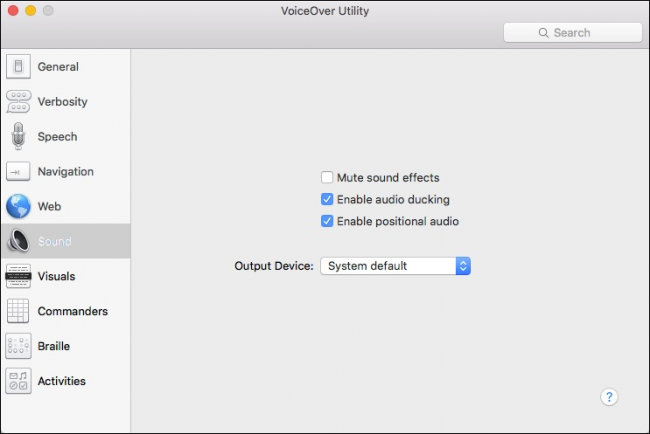 Finally, you can enable or disable positional audio, and choose your output device, which is likely to be your Mac’s internal speakers by default. Next are the Visuals options. 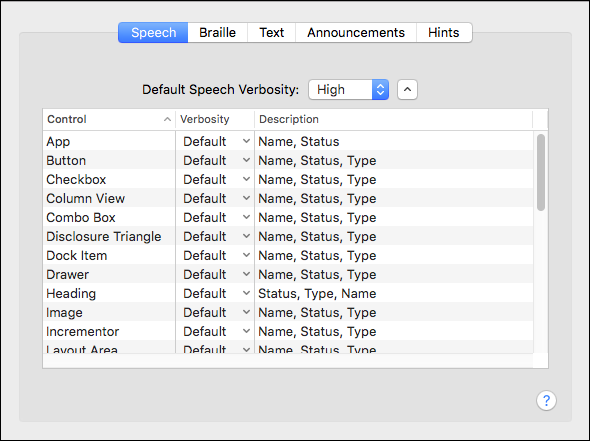 Simply, these will allow you to take control of how the VoiceOver Utility shows screen elements, such as the VoiceOver cursor, the size and transparency of the Caption Panel, whether or not to display the Braille Panel, and more. The next item in the VoiceOver Utility are the Commanders. 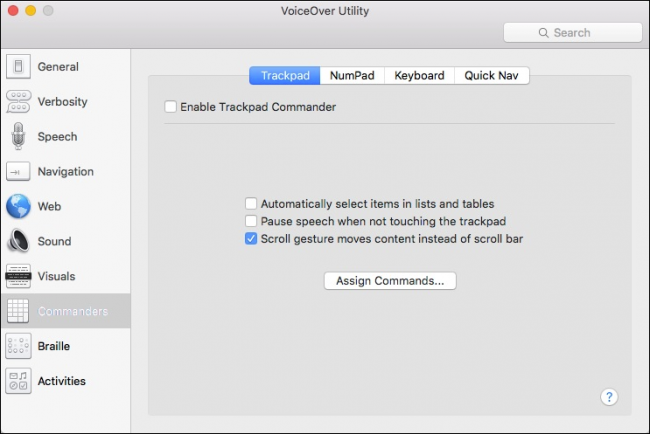 With commanders, you can assign commands to gestures, be they on the trackpad, number pad, or keyboard. You can also assign single Quick Nav keys to bind to commands. The Braille options will only be applicable if you have a Braille Display connected, but suffice to say, here you will be able to show eight-dot braille, use automatic braille translation, and so forth. 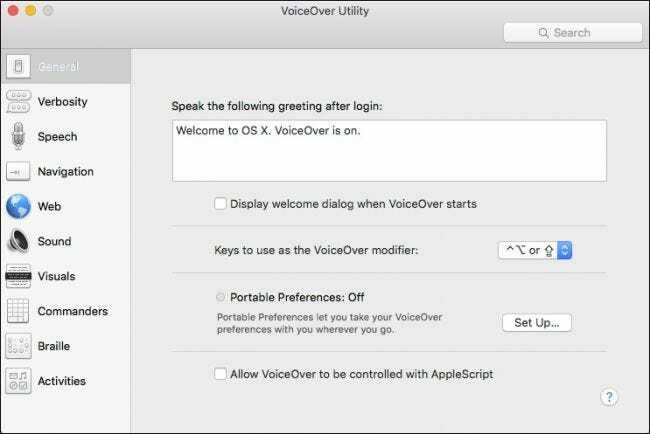 Finally, the last option in the VoiceOver Utility settings will let you set up activities so that VoiceOver is customized for specific uses. 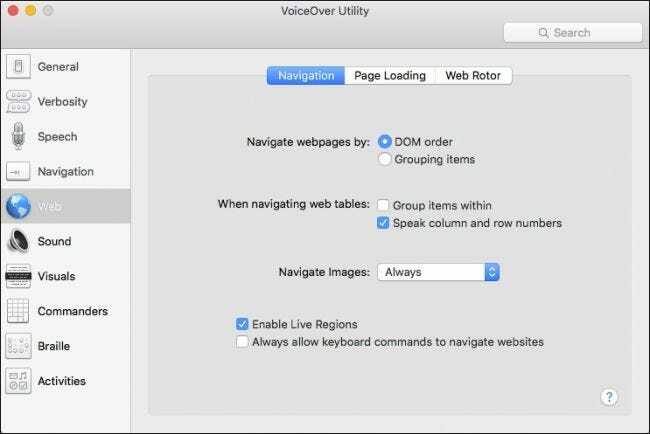 So, you can set up an activity to work with certain apps, system preferences, websites, and choose the verbosity, web settings, and hot spots. The appeal of this is that it will let you tailor how the voice speaks at what rate for certain activities. You might want the voice to speak quickly and minimally on system preferences, but then go more slowly and thoroughly on webpages. Setting up activities then will allow you to do that rather than using the VoiceOver assistant in the same way for every single window, app, and website. 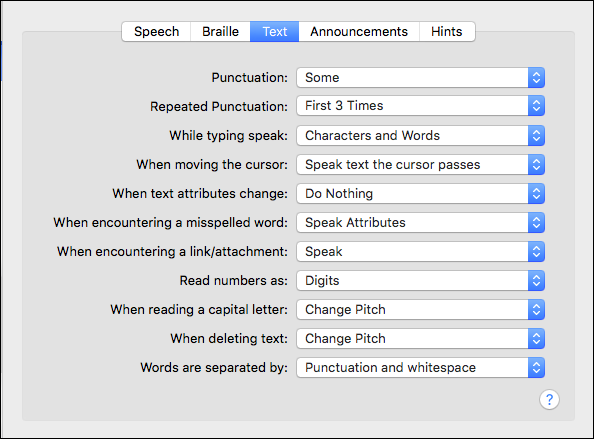 VoiceOver on OS X can be considerably useful for not only assisting individuals with poor eyesight, but even those who simply want their computer to read text to them so they can concentrate on other tasks. 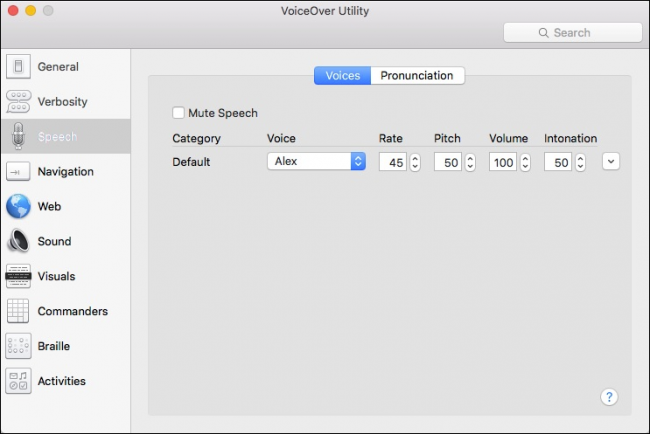 If you think you’d like to use the VoiceOver assistant or simply need to, we recommend you take the time to familiarize yourself with it and even go through the Voiceover assistant described earlier.